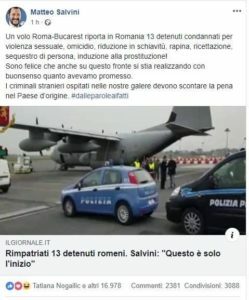 Italian Interior Minister Matteo Salvini has announced on Tuesday that 13 Romanian detainees will be sent by airplane to Bucharest to serve the sentence in their homeland. The announcement was posted on a social network, along with the #dalleparoleaifatti (from word to action) message. The message was shared by over 3,000 users in the first 30 minutes, reaching a record number of reactions of over 16,000, hotnews.ro reports. 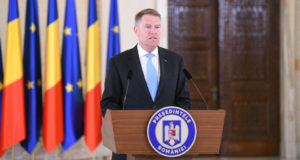 “A Rome-Bucharest flight will soon transport to Romania 13 detainees who will serve their sentences in the country of origin. They have been convicted of sexual violence, murder, abduction and human trafficking, robbery, blackmail, exploitation for prostitution. I am happy that in this way we also, with common sense, do what we have promised. Foreign criminals in our prisons can and must serve the punishment in their country of origin. The repatriation of the 13 is just the beginning, I work in this direction with my colleague Bonafede (Minister of Justice – editor’s note) who has all my support. From words we go to facts,” Salvini wrote on Facebook. The interior ministry’s announcement has sparked a wave of reactions. Along with the Italians who saluted Salvini for the decision, there were also many Romanian citizens who expressed their support. In 2018, the current government has proposed to step up the repatriation of foreign detainees, especially Romanians and Albanians. “We have 19,860 foreigners out of a total of 58,745 detainees, we will intensify the effort to conclude and apply bilateral agreements to transfer the foreign detainees to their homeland even without their consent,” Justice Minister Alfondo Bonafede said in July 2018. Currently, there are 2,539 Romanian detainees in prison in Italy, of which 1,759 have been convicted. They account for 12.4% of all foreign detainees. Most foreign detainees are from Morocco (3,808) and Albania (2,587), hotnews.ro informs. 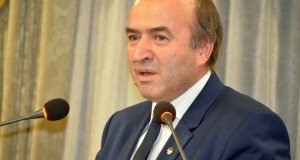 Justice Minister Tudorel Toader said on Tuesday that the repatriation of the 13 detainees from Italy to serve the sentences in Romania is proof of the capability to ensure imprisonment conditions at European standards. 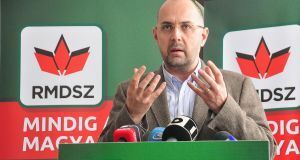 “The 13 have been brought to the country, we’ve brought back all detainees from Denmark, luckily were only a few, is proof that the National Penitentiary Administration (ANP) has the capability to ensure proper conditions, at European standards, for serving the sentences,” Toader said in Parliament. ANP has announced on Tuesday that the 13 detainees have been taken over and are incarcerated at the Rahova Penitentiary.